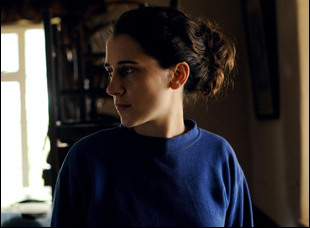 You need not look at the storm clouds on the horizon to know these are turbulent times for Clover, the heroine of Hope Dickson Leach’s “The Levelling,” but instead of the weathered face of Ellie Kendrick, the ferocious actress playing her. Having just returned to her father’s farm in Somerset to grieve the death of her brother Harry – a case that’s been ruled a suicide, but she has her doubts – Clover comes back to make sense of the situation, likely with no help from her estranged dad Aubrey (David Troughton), and with anxieties running even higher because of the precarious state of the land where recent floods have left the livestock as the last remaining thing of value, things are always at risk of getting heated if only the environment weren’t so perpetually damp. Yet Kendrick, who is perhaps best known as the resourceful Meera Reed on “Game of Thrones,” brings fire to the role of Clover, a vegetarian stuck in cow country whose departure to attend school to become a veterinarian weighs on her in light of Harry’s death, but isn’t about to be bulled by Aubrey, who is not above suspicion. Her tenacity is matched by Dickson Leach in her feature debut, taking inspiration from the real floods that ravaged Somerset in 2013 to create a vivid portrait of both a place teetering at the whims of nature, and people fighting the darkest corners of their own as they deal with a defeating sense of bereavement. As the striking drama hit the Toronto Film Festival to make its world premiere, Kendrick spoke about the excitement of taking on her first lead in a film, drawing upon the experience of being in Somerset on a working farm to inform the character and all the new and unexpected skills she picked up in the process. How’d you get interested in this? For me, it was really exciting to see a story, which is so emotional and so much to do with family and the land, but written as almost a thriller. I was really excited by the intellectual clarity versus her emotional difficulties. On one hand, she’s forensic in tracking down the evidence of what’s happened to her brother – she’s very systematic. But she’s unable to deal with any of her huge emotional closetedness. That was a really exciting tension within the script and I loved also that it was a very British story, but in an unconventional way. There’s a big divide between the rural and urban populations in the UK and if you know about the floods, it’s a big story in the UK, but one that got brushed under the carpet. People’s lives were completely decimated and the fact that Hope decided to go in, collaborate with this community and tell a real authentic story through the eyes of this fantastic fiery heroine, I was really excited by it. And you were game for the farming work the role entailed? Oh no, I love it. Whenever I approach any role, if I think, “Oh, I can do this” and I’m not scared by it, then I don’t want to take it. If it’s something that terrifies me, then I’ve got to push myself in that direction, so it was really exciting to get the chance. Hope has said that she was so impressed with the research you did for the role – do you go off and do a fair amount of that on your own? The script was so well written, there was already a strong character there. Sometimes you come to scripts and think I’ve got to do a lot of work here, but there was such a huge emotional well here already that we could use as a springboard to make a character very full together. I did the normal research that you would do as an actor, for example, going to the farm and learning how that worked. Then, just through conversations with Hope develop the character. I also was in pretty much every scene, so you’re just being the character all day whereas normally when you’re doing with film or TV, it’s a lot of sitting around. We did it in a short period of time, and that actually really helped for the intensity of the character I had to play. I couldn’t escape her; I had to play her all day, every day. Hope and I were able to talk through the script and I could say, “I don’t know how I feel about that line” and “Maybe we could change this” and she was really open in the whole process to making sure that everyone was happy and involved and invested, which is pretty rare. It’s also unusual that this appeared to be a rare film with a primarily female crew. Was it different in that way? It was brilliant. It wasn’t even intended, but somehow this incredible chance occurred that our camera crew was all-female. Not only was the [cinematographer] female, which is rare in itself, but the camera assistants and the focus pullers were all women and as you can see, the results were brilliant. And we had female heads of department in costume and hair and makeup. It just happened that this group of brilliant women all came together with lots of brilliant men as well to make this film. I do think it affected it in a good way because I’ve never felt a sense of community and collaboration like that before. That was another reason why it was a project I’m so proud of. What was it like interacting with the community where the film is set? It was really important to us to tell the story faithfully. Hope had spent a long time getting to know the people there and they’d been canoeing to this local pub when everything got flooded and [that pub] was actually the production base for the film. We got to know a lot of the people in the area who’d been affected and they were really open in sharing their stories. They want this story to get out there. What was exciting was combining all of that research and scrupulous attention to the historical detail and matching it with what Hope brought to the film, which was this amazing family drama. Was there a detail that opened up who this character was for you? It’s actually funny – the fact that she was vegetarian was very useful for me. Since working on the farms and playing the role, I have become vegetarian myself and her political environmental dedication was really useful as a window into the character. On one side, she is militant in her logic and in her belief in her principles and It makes it difficult for her relationship with her father. On the other side, she’s this hurting, wounded child who’s desperate for love and tenderness and affection. That central tension was the key to her character and made her a really interesting character for me to play. There’s a scene where you see Harry in photos on a cell phone – you look genuinely surprised, which made me wonder if Hope played little tricks on you to get a reaction? Yeah, I encouraged Hope to play those tricks on me. I’m not really a method actor, but this is probably the project that I’ve been most emotionally invested in, so Hope wanted – and I encouraged her – to surprise me with some details. In the film, there’s the evidence bag with the clothes and the photos on the phone, or even when she goes to the mortuary and she sees his body – all of those images and those objects, I asked for them to be hidden for me until the moment, so I could discover them in the scene, which was really helpful. I felt a bit self indulgent, but it was really useful for the reaction. There were so many. It was quite a fast shoot, so we didn’t have a whole lot of time to dwell on things. For the very last scene of the film, it was very dramatic. There was all this emotion and they had this big fire truck, which was powering the rain machine that we were going to use for the whole day. We were filming on a different farm that scene – a place that was completely underwater for six months after the floods and they had to have hundreds of cattle for six months cooped up – and the cows were insane. They were charging at us. We had four people from the crew trying to push all the cows away. The rain machine was getting ready when it fell into a ditch and we ran out of rain very early on in the day. But me and David had been covered in water [already] and we were just spending the whole day shivering with the rain machine that didn’t work and menacing cows approaching us. When we were filming it, I thought there’s no way we’re going to get this done, but it actually ended up looking amazing, which is great. Has this been an interesting time for you as an actress? It seems like you’re going to be able to take on more mature parts now. It is. I started when I was really quite young and I guess I still look younger than my age, but there was a long time when I got frustrated when I was in my late teens, still playing 13- or 14-year-old characters. It’s an exciting time now because it feels like, as you say, there’s more fluidity. Sometimes that’ll be women in their mid-twenties, but I can also go younger like Meera Reed, who’s 17. It’s nice there’s new places to push myself in. And really as any actor will say, it’s always just about a good script coming through no matter what the age or what the character is. If you get that feeling – firstly, I’ve got to play this, and secondly, how the hell could I play this? – whenever those things come along, whatever the character is, you really got to do it. How did you initially get interested in acting? I started getting TV roles and when I was 17, I had I guess my first breakthrough when I played Anne Frank in “The Diary of Anne Frank,” which was a BBC 5 part TV series and came out in America on PBS as well. That was the turning point. I carried on all the way through school and I went to university as well — I did English literature at Cambridge, but on all of my holidays, I’d do TV and film parts. It’s only been the last four years that I’ve been acting full-time, but so far it’s been going well. What’s it been like to come to the Toronto Film Festival with this film? It’s very exciting. I’m just looking forward to sharing the film with the world. For me and for most of the people on this group, it felt like there’s something really special about this and the story we’re telling. It was a real privilege to be selected and it’s a really exciting start on the journey of this film. “The Levelling” opens on March 31st in Los Angeles at the Laemmle Music Hall. All future dates and cities are here. Interview: Simon Barrett on Daring to Go Back to the Woods for "Blair Witch"